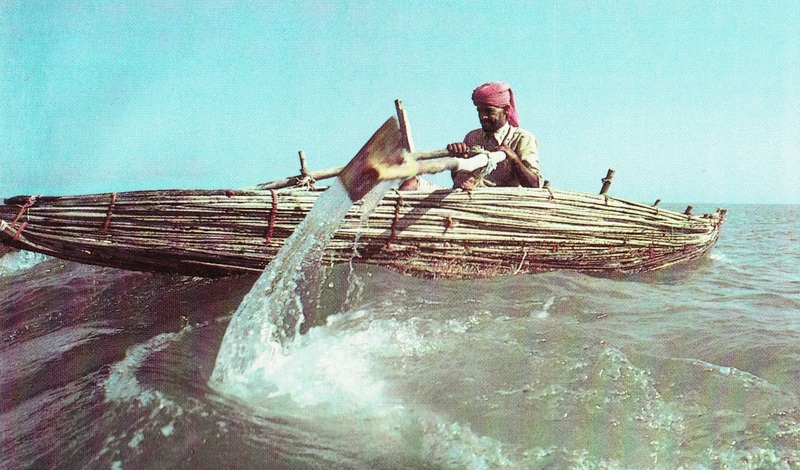 This brought to mind the following photo of a shasha, another Omani bundle boat, from Tim Severin’s The Sinbad Voyage, which I reproduced in a post several years ago. But unlike the boat in the Daily Kos photo, this one was made from palm fronds. 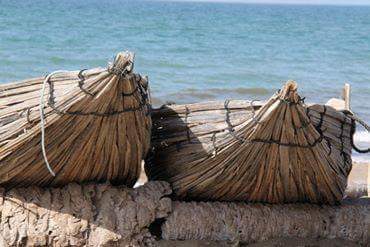 The very next day, an image of another Omani bundle boat, also apparently made of palm fronds, appeared in my Facebook feed. 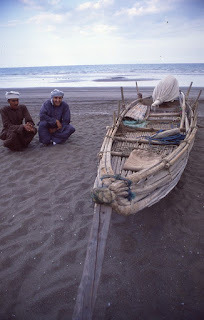 I found it surprising that, even in the present day and within the confines of a rather small country, two methods of bundle boat construction, based on different materials, remain in use. Bundle boats are not really boats: they are boat-shaped rafts that derive their buoyancy from the materials of their construction, which are themselves buoyant. In contrast, true boats achieve buoyancy enclosing air within a watertight shell (or, to phrase it another way, by excluding water from a watertight shell). 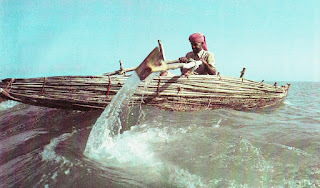 In most cases, bundle boats are made from soft, flexible materials like grass, rushes, reeds, or leaves, large amounts of which are wrapped with cordage into long bundles – generally pointed at both ends – and then tied to other bundles into a boat shape – i.e., pointed at the bow (and often, at the stern), and usually with something approximating either raised gunwales, also composed of bundles, or a cockpit formed by leaving a cavity in or between bundles. Sticks, roots or branches may also be used for construction. In most cases, these are tied into bundles in a manner similar to that used for soft, flexible materials, but in others, they are arranged and lashed side-by-side and not truly bundled. This method reduces the craft’s buoyancy and freeboard, also reducing its payload and leaving the boatman’s bottom constantly wet, but it also reduces its weight and makes it easier to dry, probably prolonging its life. An ambatch canoe on Lobito Bay, Angola. In this example, the branches are not truly bundled, but are lashed side-by-side into a boat shape. 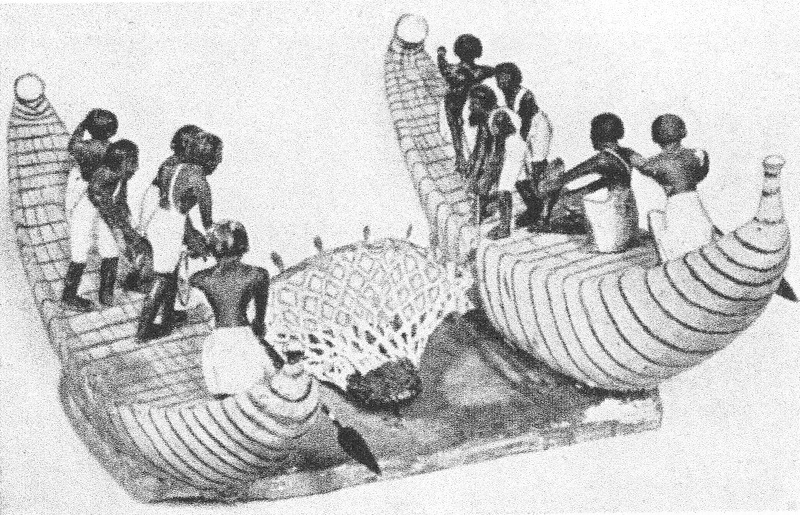 This photo and the one above it are from Hornell's 1946 work, Water Transport: Origins and Early Evolution. I don't know if such craft are still in use. 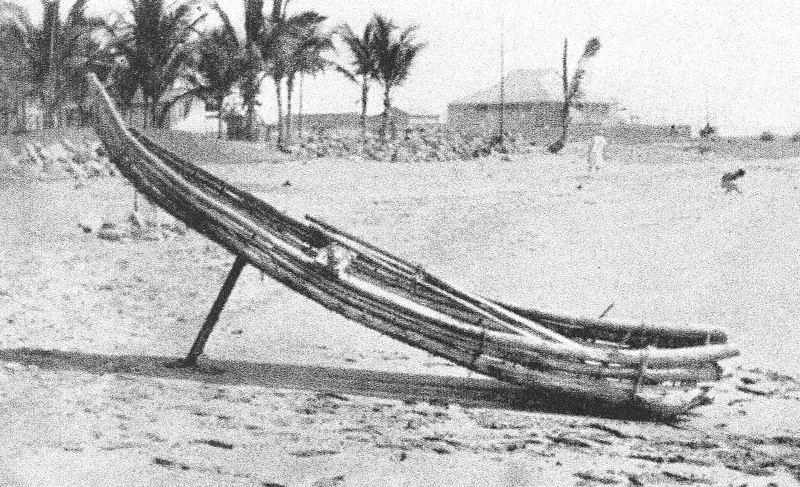 Somewhat similar reed “boats” remain in use on Lake Titicaca, although they have substantial bundle gunwales, and thus a definite “inside.” What most distinguishes these craft from Egypt and Lake Titicaca from the Omani, Upper Nile and Lobito Bay types shown above, however, is the large volume of the bundles in comparison to the load, placing the boatman and his cargo well above the water and giving fair promise of keeping him and his cargo dry. The bundle boat was an technological dead end in the sense that it apparently never evolved anywhere into a true boat. Although stick-built bundle boats appear superficially to be a step in that direction, they are still solidly rafts in concept. But technological evolution is not the sole measure of past or present validity. The fact that bundle boats remain in use in more than one culture in the 21st century testifies to their practicality and the soundness of the concept. We haven't had time for a post lately, so to keep the pump primed, we'll bring this recent news item to your attention, courtesy of The Courier. The Carpow boat, a 3,000-year-old logboat excavated in 2006 from the River Tay in Scotland, was recently moved to a permanent home at the Perth Museum and Art Gallery. The 9.25-meter-long boat was recovered in generally very good condition, and it includes the transom board that closed in the stern. It is the second oldest logboat discovered in Scotland. Sadly, much of the bow is missing, but it is still one of the best-preserved Bronze Age logboats in Britain. This short video summarizes the excavation. This next video shows the boat after conservation. The transom board is not in place, but you can clearly see the bosses that held it there, which were left standing on the inner surface of the boat when the trunk was carved out.